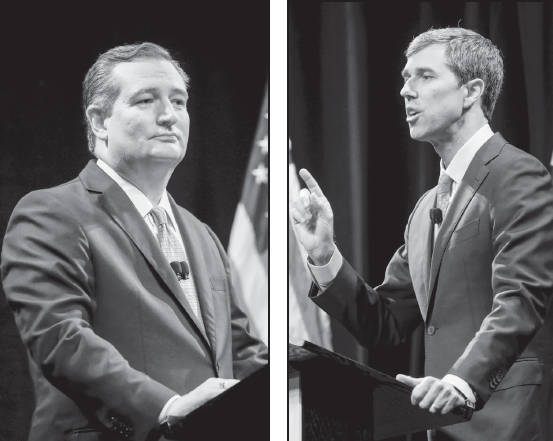 Republican Senator Ted Cruz and Democratic Representative Beto O’Rourke Texas battled over healthcare, immigration and law enforcement in their first debate on Sept. 21. From the outset, the aspirants went after each other. The language was blunt and fierce with both contestants looking to land a knockout punch. Immigration was the first topic. Republican U.S. Senator Ted Cruz, left, takes on Democratic Rep. Beto O’Rourke in a debate on the SMU campus on Sept. 21. O’Rourke called for a pathway to grant Deferred Action for Childhood Arrivals (DACA) recipients and illegal immigrants for citizenship. Law enforcement and police brutality was another point of contention. “If African-Americans represent one third of people shot in America then we have a problem,” O’Rourke said. Cruz argued that the rhetoric O’Rourke espoused was furthering the divide in America. He suggested that O’Rourke recently associated the police with old Southern traditions. “I think it is offensive to call police officers modern day Jim Crow,” Cruz said. O’Rourke responded with his support for the Second Amendment but reiterated his desire to see fewer shooting incidents. “Weapons of war belong on the battle field, not in our schools, churches or life,” O’Rourke said. Cruz and O’Rourke clashed over NFL players kneeling during the national anthem. O’Rourke asserted his belief that the protests are the fundamental rights given to American citizens and that “there’s nothing more American “ than being able to protest peacefully. Cruz said that kneeling during the anthem was disrespectful to veterans. Cruz reiterated his belief that everyone has a right to protest but should do it in way that doesn’t “disrespect the flag.” Cruz insinuated the protest was inciting people to burn the American flag. The two candidates have been closer than ever before in polling. Beto O’Rourke is hoping to cause an upset while Ted Cruz is hoping to help maintain the Republican majority in the Senate. This was the first of three debates. The next two debates are set for Sept. 30 in Houston and Oct. 16 in San Antonio.